Johannes, Jan or Johan Vermeer (/vərˈmɪər/; Dutch: [joːˈɦɑnəs jɑn vərˈmeːr]; October 1632 – December 1675) was a Dutch painter who specialized in domestic interior scenes of middle-class life. Vermeer was a moderately successful provincial genre painter in his lifetime. He evidently was not wealthy, leaving his wife and children in debt at his death, perhaps because he produced relatively few paintings. Johannes Vermeer is currently considered a "single author." If one or more works are by a distinct, homonymous authors, go ahead and split the author. 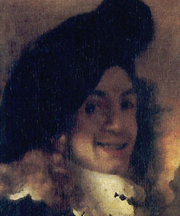 Johannes Vermeer is composed of 6 names. You can examine and separate out names.